You never know when the need will arise to give some scriptural encouragement. Jehovah deeply cares about ‘those crushed and lowly in spirit’ (Isaiah 57:15) and His Word urges us to ‘keep encouraging one another’ and to ‘speak consolingly to those who are depressed.’ (1 Thessalonians 5:11, 14) Unfortunately, it’s not often you can shop for cards without being bombarded with Xmas cards, birthday cards and other such unchristian paraphernalia. Well search no more! At Ministry Ideaz, you’ll find scores of beautiful theocratic greeting cards made just for us! These beautiful Christian greeting cards are made by Jehovah’s Witnesses and for Jehovah’s Witnesses. They feature themes such as: Spiritual Encouragement, Christian Blessings, Ministry and Meetings, Friendship / Thank You, Goals and Milestones, I Love You!, New Baby, Get Well Soon, Praise, Prayer and Supplication, Scriptural Counsel, Study and Meditation and Sympathy. Most of our cards are also available in Spanish! Sorry, but... if you need something for Easter or Thanksgiving, you'll have to look elsewhere. Our Christian Greeting Cards for Jehovah’s Witnesses are always good to have on hand! An encouraging card from Ministry Ideaz is sure to lift someone's spirits at a moment's notice. The greatest comfort of all comes from knowing that there is a caring and compassionate God on whom we can place all of our burdens. 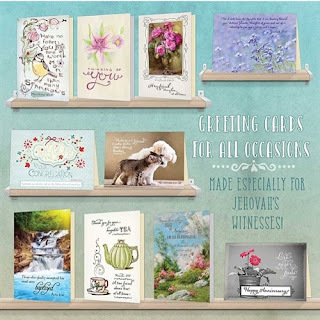 Please remind anyone in need of some encouragement of this by sending them one of these wonderful Jehovah’s Witness greeting cards from Ministry Ideaz. What is only a few dollars to you can make a world of difference to someone who feels downtrodden! Have you ever been encouraged by a kind word or a small note in a card? What have you done to encourage others? Please share with us in the comments below! Beautifully made JW greeting cards each is accompanied by a verse from the New World Translation.